Disclaimer: wmhdplop will not enlarge your hard-drive. Indeed it will not enlarge anything. Please stop sending emails about enlargement, I don't want to be enlarged. 2006/12/01 wmhdplop 0.9.8 fixes some minor glitches. 2005/06/17 wmhdplop 0.9.7 fixes a small memory leak and tolerates swapless configurations. 2004/07/14 wmhdplop 0.9.6 is out ! (bugfixes related to gkhdplop, and support of 48x48 and 56x56 docks). 2004/07/07 wmhdplop and gkrellm-hdplop are now in Debian Sid \o/ Thanks Gürkan! And wmhdplop 0.9.5 is out ! 2004/04/06 0.9.4 is out.. 0.9.3 was broken with respect to devfs. This one is better. It is stronger. It is more robust. It is a good one. 2004/04/06 0.9.3 is a bugfixed 0.9.2. Crash less. Works better. Should recognize scsi drives. And even raid arrays. 2004/04/04 0.9.2 is out thanks to dae, who added gkrellm support (gkhdplop). 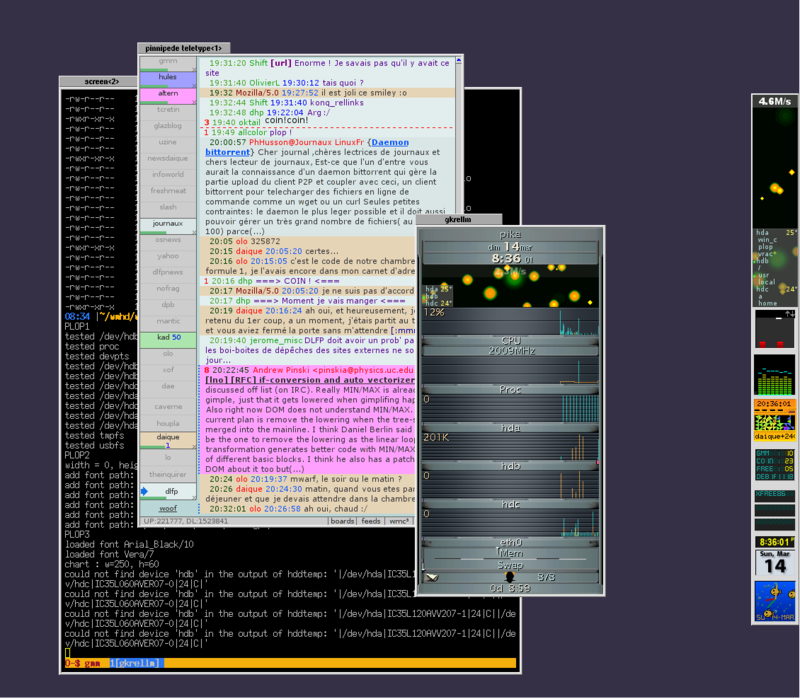 2003/18/12 0.9.1 is out with better support for gnome-swallow, and undocked-mode. 2003/07/12 \o/ houpla has put wmhdplop in the Mandrake cooker contribs, and built an rpm for the mdk 9.2.
wmhdplop loves the gnome-swallow meta-applet -- config used for this example here. gkhdplop was born with release 0.9.2, you can see it in action here. New ! wmhdplop : The Movie. wmhdplop is yet another dockapp for WindowMaker, or any windowmanager/desktop environment that handles dockapps (KDE has a dockbar extension, and gnome swallows). It monitors your hard-drives by sending visual stimuli to your cortex each time your /dev/hdx (or /dev/sdx) writes or reads anything. Try to launch openoffice and enjoy the wmhdplop show! (loading these kitties in mozilla also works). useless animation reflecting disc I/O. another useless animation reflecting swap activity. a textual information of your harddrive throughput. supports ide drives, and (not 100% sure) scsi and md arrays. display of the hd temperature if the hddtemp daemon is running. If your consider trying wmhdplop, I highly encourage you to install the developpement package of imlib2. Compile/install wmhdplop as usual: ./configure && make && su -c 'make install'. Take a look at the numerous and glittering options of wmhdplop with the -h flag. Since imlib2 only supports ttf fonts, you may have to download/install some of them (wmhdplop prefers Arial_Black from the msttcorefonts, or the Vera ones). a 2.6 Linux kernel (statistics are in /proc/diskstats), or a 2.4.20+ kernel with CONFIG_BLK_STATS=y (check the "Per partition statistics in /proc/partitions" entry in the kernel config). Download wmhdplop packages or older versions. "The road is straight, but the slope is strong." Jean-Pierre.